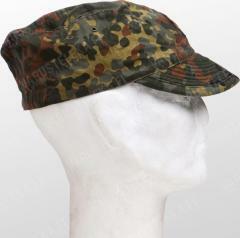 Usually the German field caps have been pretty good looking, but the Heeresflieger cap is a nasty exception to this rule: this one is like a camouflaged, floppy baseball cap with an elastic back. It actually looks a bit worse when worn compared to our pictures, which should tell you something. We get these from time to time among the regular BW army field caps we source. This means we can't promise availability, but we can't discontinue these either, so please stop asking (for the latter)! In used, but good serviceable condition. I'm usually a 57 so i bought a 59 but with the elastic the fit is ok. This will make a good summer cap when i'm out on the moors. Fits like people expect the regular field cap to fit (i.e, over the head instead of perched on it), although you should probably still go up a size or two. Ugly as sin, but a great cap.